This week's addition to SAGA LOTR is the Elves. I thought the Jomsviking battleboard (with its Wrath mechanic) provided a good way of modelling a smaller force, with superior abilities. The board I came up with mixes Jomsviking, Welsh and Anglo-Dane abilities with a couple I added. It isn't on the pretty full-colour SAGA background as I think this doesn't quite suit the more civilised Elves but I hope that you will find what I came up with ok. I think this board and list will give a small force that is capable of superior hit-and run tactics while having the option to also field a tough line of heavy troops worthy of the Battle of the Last Alliance. 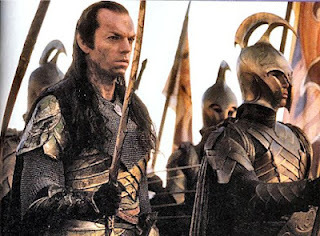 This list models the Elven forces from Peter Jackson's movies so is intended to cover the Battles of the Last Alliance, the forces of Rivendell, and the forces of Lothlorien, including those who were at Helm's Deep. 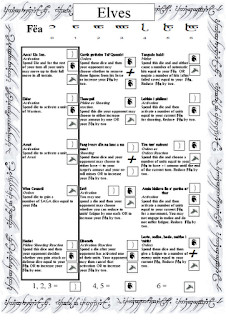 To reflect the scarce numbers of Elves in Middle Earth, most of the force will be composed of Eldar (Hearthguard in SAGA terms) and only up to two points may be spent on Avari (Warriors in SAGA terms) for every six points (or part thereof) in the warband. Elves have nothing like levies. Any Elven foot troops may be equipped with bows, which then gives them -1 armour vs shooting. Elven troops may be fielded mounted, giving them -1 armour vs enemy shooting but a move of L.
Elven troops may have Elven Cloaks. If so, they have -1 armour vs melee and shooting (but if armed with bow are not further penalised, ie still -1 vs melee and shooting). The cloak means they cannot be shot beyond M range. Next up...Mordor or Minas Tirith? That looks really good Jamie! Great work! I might even be able to squeeze in a game next week to try it out. Any special rules for Glaives or just leave them as Hand Weapons? Likewise anything special for the wood elf enchanted cloaks? I knew I was forgetting a troop type! Edited above. 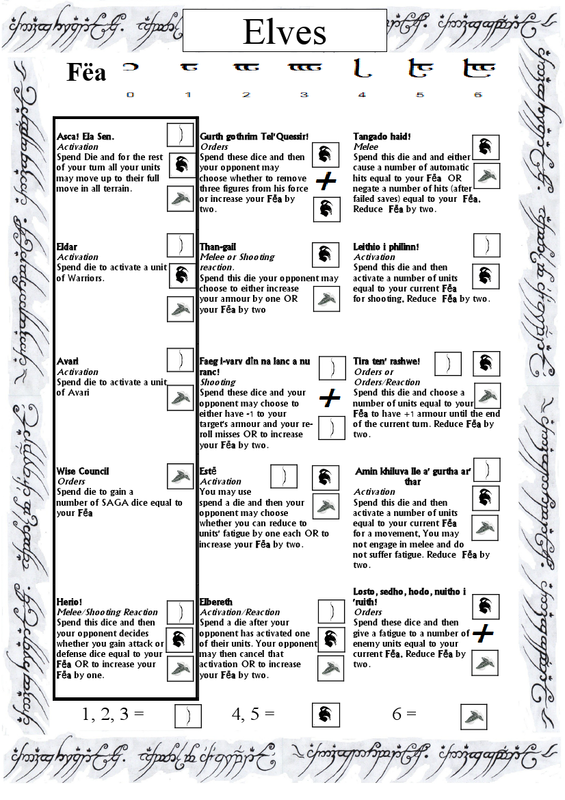 My vote is for Tirith next! Glaives would be Danish Axes wouldn't they? Maybe I should hire you to write up the Kyivan Rus'? I think Jason had it right at 'leave glaives as hand weapons'. It's bigger than a sword but not a big choppy weapon like the axes wielded by the men of Lossarnach? (and potentially some Orcs...) I didn't make the big Berserker blade any choppier either and SAGA tends to not sweat differences too much unless a given unit was famed for something - like Jason's Elven cloaks! Just thinking... ENTS same as troll... 2 point unit?